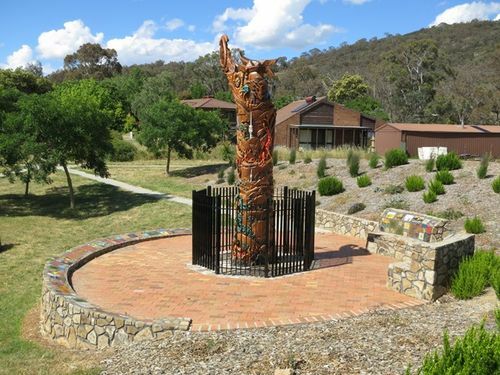 The carved Storytree was designed and created by the Mount Taylor Estate community, and carved by artist Bryan Carrick on one of the trees that was left standing after the devastating 18 January 2003 firestorm. It was unveiled in October 2005, and the tree has become a symbol of the Mount Taylor Estate community’s spirit and resilience. Over time the tree had deteriorated and it was restored in time for the 10th anniversary commemorations in 2013. The Canberra bushfires of 2003 caused severe damage to the outskirts of Canberra, the Australian capital city. Almost 70% of the Australian Capital Territory’s pasture, forests (pine plantations) and nature parks were severely damaged, and most of the renowned Mount Stromlo Observatory was destroyed. After burning for a week around the edges of the ACT, the fires entered the suburbs of Canberra on 18 January 2003. Over the next ten hours, four people died and more than 500 homes were destroyed or severely damaged, requiring a significant relief and reconstruction effort.